Olly’s camp – an ample 3 man tent, a space for an open fire, & boxes of veg outside. My inflatable mat and bivi seemed inadequate by comparison. I have a policy of always picking up hitchikers, and picked up Olly at a petrol station in Totnes. 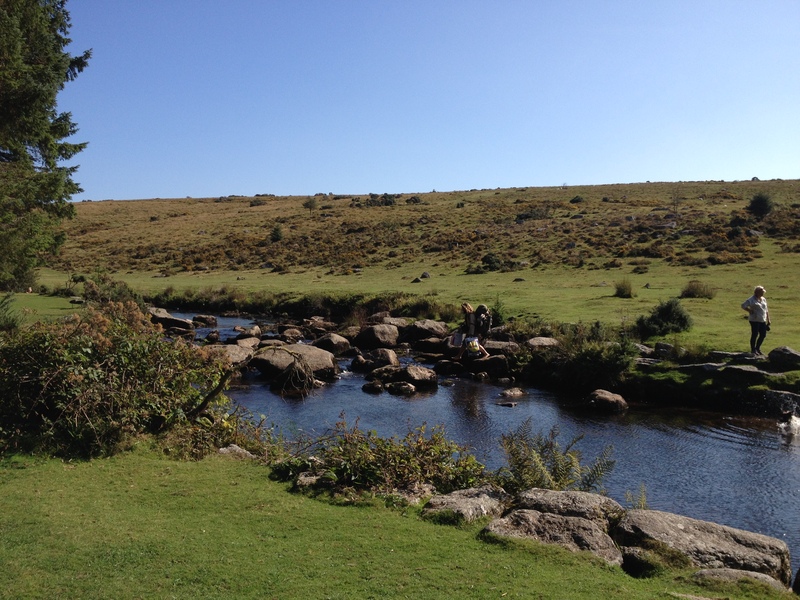 I was on my way to spend the weekend on Dartmoor and so was he, except he had already been there a few days, and had been backpacking around the world for the past 5 or 6 years, with some, then, little, then practically no money. 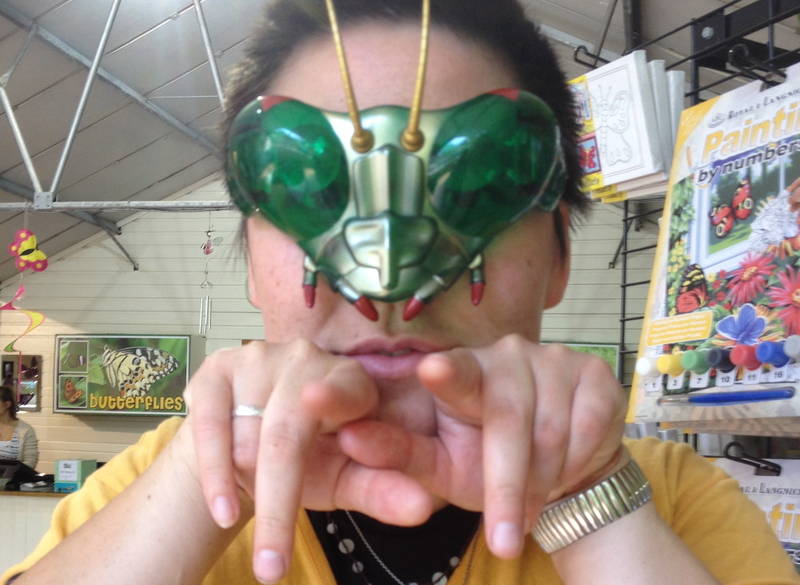 That day he’d been in Totnes dumpster diving and asking local shops for the food they were throwing out. He had a big box of carrots. “That’s a LOT of carrots!” I said. “Yes,” he replied, “unfortunately it was the same thing yesterday”. On the drive back to his camp, which was secluded enough that it could be safely left, I questioned him about his way of life and he about mine. I was fascinated by how he got by with just a backpack and no money, and he was fascinated that I do things I love for a living. It seemed that during his college years he had lost the will to continue, knowing it would only lead to a job he didn’t want, to pay for a house / life he didn’t want. Instead, he took all the money he had and went travelling around the world, eventually learning to live with barely any. The exception to this being his airfare home a month ago, which used up all the remaining cash he’d been saving for exactly that purpose. Whilst I’d gone to university, investing in skills that would allow me to make my living, he’d spent his savings on a different kind of education – learning to live without money as his ran out. 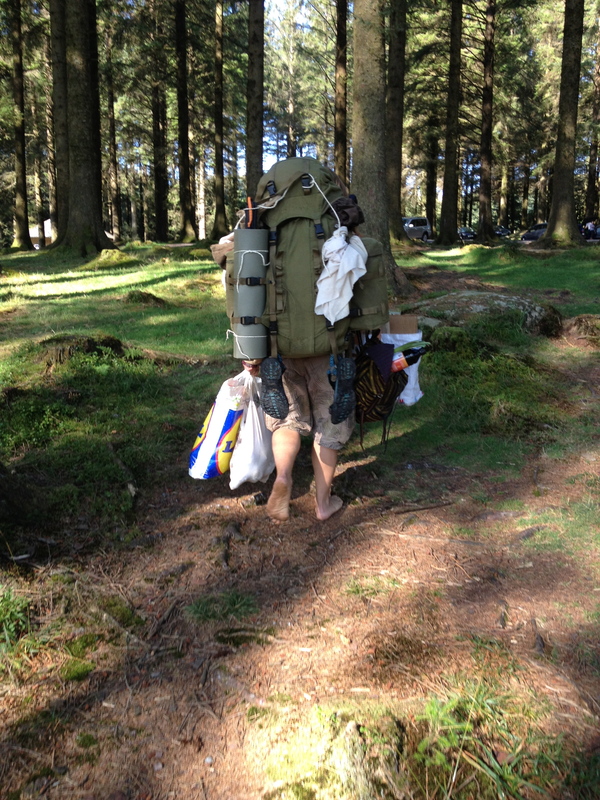 Now back in England, he backpacked, hitchhiked, camped, stayed with friends and moved fairly freely. When staying in one place for a while, he’d always try to gather 5kg of food so as to have plenty spare. Although he’d bought his camping kit with money initially, if something broke, he mostly knew how to repair it, how to make another, or as a last resort, to find a way to get one for free. He explained how to mini rocket stove from a tin can and had an ideas for how to make a tent from a few discarded broken tents. He also knew something about wild food, and was sprouting sprouts in a cloth bag hung from a tree over the river. I was amazed when he crossed the river by stepping stones so quickly it was like he was walking on soft grass, even whilst holding the box of carrots in both hands. By contrast I crossed slowly, checking my footing at each stone, and still almost fell in. Crossing the river, easily, no matter the weight of his luggage. Olly was truly a modern hunter-gatherer, ‘living off the land’, or more accurately living off his surroundings. Like ancient humans he took food, shelter and clothing from whatever was abundant around him. But whilst cavemen might have foraged for food, found shelter and worn animal skins, Olly would dumpster dive for food and go urban-foraging for everything else, using what other’s discarded. In this sense, he could be seen as living at not just carbon zero, but carbon plus, since everything he consumed would otherwise be thrown away and release greenhouse gases. Yet, he was dissatisfied with his way of life, seeing no future in it. Olly told me of his dream: to build a group of self-sufficient communities all around the country. His years travelling had finally brought him to this conclusion. However, to do to this, he would need to find like-minded people and gain resources to buy land. It seemed that making documentary films about his lifestyle would be a good way to start, gaining interest on social media. For this he would need a waterproof camera, laptop, frequent Internet access, and ideally a van. He proposed either running a crowd-funding campaign or getting a job to gain the money for this kit. Olly had come to the same conclusions I had: it’s totally possible to live without money, but almost impossible to do any wider good in the world whilst off the radar in this way. Getting back on the radar meant owning technology and a vehicle, both of which cost money to buy and maintain. Yet I can’t see Olly putting on a suit. I think it would genuinely be destructive for him and he’d probably become too depressed to keep sight of a dream he was no longer inhabiting. I can say the same for myself. This is probably why Olly was so fascinated with me as he saw me earning a living without hating my job. It was extremely helpful for me to see in Olly what a lifestyle that truly boycotted everything looked like. As a Buddhist I strive to refrain from doing harm. Therefore I’d love to be able to say “I don’t contributing to the slave trade” or “I don’t support business that pollute the environment”. However, whilst Olly’s lifestyle does no harm, he’s now in a position where he can do no wider good either. I hope Olly gets his camera and realises his dreams, because it’s time for those who are living globally conscious values to be on the radar, to be visible and create a global force for good! What’s The Carbon Footprint Of Living In a Van? Our carbon footprint is a big deal. If we don’t reduce it, it’ll literally be the end of the world (through climate change). Being aware of how much carbon our lifestyle is emitting and how best to reduce that figure can be a huge help, so this week I’ve been trying to find out more. My attitude has always been a little radical. Although most people live in a house and have a car, I’ve always felt it would be excessive of me to have both. For the past 10 years I’ve worked as a musician and sporadically worked for someone disabled and both these jobs necessitate a car. So, the only way I’ve felt able to justify having a vehicle is to live in it too, thus ditching the house. I tried a year the other way around – with house, without vehicle. It was an enjoyable challenge. However, gigging car free was so limiting as to be unworkable in the long term. So then I shared a van. Now I live in one of my own, using housesits and friend’s living rooms to subsidise my lifestyle. So far so good. But since buying a van, bit by bit, I’ve taken on more and more work that requires driving and have worried about how much pollution this generates. I became curious about my carbon footprint? Surely it must be below average – that’s part of the reason I’m living this way. Using an online Carbon Calculator, which factors in most everything, I entered minimum and maximum estimates for my annual energy usage. It included annual mileage, an educated guess home energy usage (when I’m at other people’s houses), public transport, food and the limited consumer goods I buy. Disappointingly my carbon footprint is between two thirds and three quarters of the UK average per person – I had expected it to be much less. To make matters worse, around half of my carbon emissions come from driving the van. If only I had a modern van with lower emissions, or drove a small car instead! As it is, using public transport or cycling would be about 90% better for the planet than using my big old van. I’d certainly recommend using the calculator. It’s a helpful tool to show where you can effectively & easily cut down. In some cases (home energy especially) being careful saves you money too. I’m definitely going to try driving my van less – I had no idea it accounted for HALF of the pollution I create. The website also had some good info on which energy saving habits make the most difference around the house. I’m pretty sparing when I’m housesitting out of respect to my hosts, and am always keen to improve. My alternative lifestyle doesn’t reduce my carbon footprint as much as I had hoped, but if everyone in the west could drop their usage by a quarter or a third, the planet would be in much better shape. I’m not saying everyone should live like me – that wouldn’t work. But could you find a way to reduce your emissions by 5% 10% 20% or even more? Could you persuade the company you work for to do the same? Everyone will have a different way of doing it. Although owning a van is my worst offence, producing between 3.2 and 3.8 tonnes of CO2e per year, it was interesting to see that someone could do much worse by simply being a wasteful consumer. Re-doing the Carbon Calculator as if I was someone who didn’t recycle much, bought a new car, supermarket food, loved fashion and the latest gadgets, showed that this behaviour alone would add over 8 metric tonnes of CO2e to someone’s annual pollution quota! If you’re a high consumer, you could make a big difference through simple lifestyle changes that are guaranteed to save you money too. I’ll leave you with some environmental pros & cons of my current way of life. Can you think of any more? Comments welcome. Also, do write to me with suggestions as to how I could reduce my carbon footprint even more. Limited consumption of consumer goods: borrowing/sharing other people’s stuff rather than buying my own. When housesitting this includes white goods, washing machines, and a good many other things too! Food shop wherever I can in transit – less likely to find unpackaged local food. Lend out many possessions to avoid storing them in the van, therefore helping others to avoid buying. Hard to recycle when in van due to limited space to store rubbish. This is an area I could improve. Make use of otherwise wasted energy: When I housesit for someone and use their fridge, they wouldn’t otherwise turn their fridge or central heating off whilst on holiday. The same applies if I use someone’s living room as office space whilst they are at work in winter, as long as I don’t turn the heating up! Pollute by driving to housesits and living rooms. Have more time to source 2nd hand or free things & food rather than buy new: Often, this process leads me to rescue stuff being thrown to landfill, take what I need and give the rest to a good home or charity shop. Often don’t have enough money to buy ethically, or take public transport where it’s more expensive than driving. Use less energy in houses: I’ve had to adapt to the fact that I can’t wash myself or my clothes as often as I used to, but I’ve done it WITHOUT lowering my standards of personal cleanliness. Honest! More about that in future posts! Prone to rely on/be offered work that requires driving. After finding a 2 man tent in the street, I decided to have another go at sleeping outside. This summer I’ve made some attempts at this, but been quite limited by the fact that my kit isn’t really suitable or waterproof. My experience has been less of sleeping outside than of lying outside in the dark feeling uncomfortable. A tent could be the answer – but won’t it be conspicuous compared to my usual trick of lying on the ground in a sleeping bag? 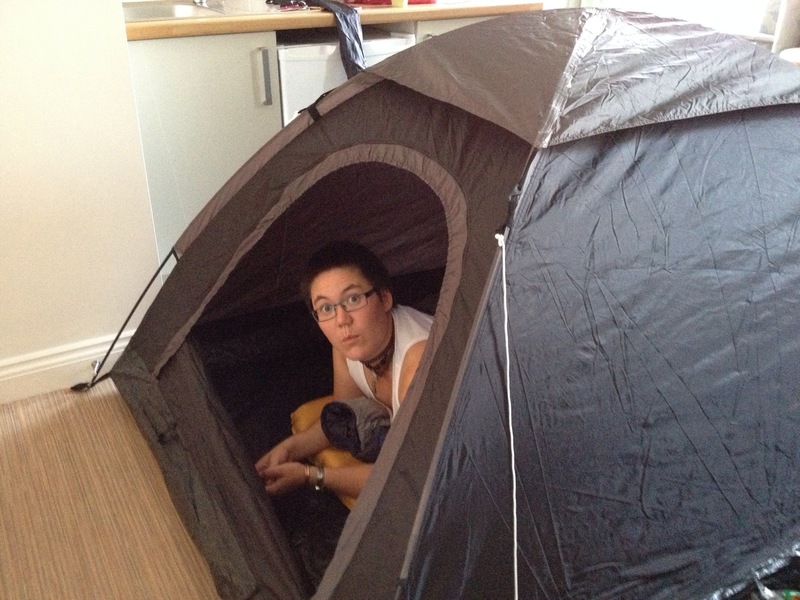 testing the new tent, indoors. The overall aim here isn’t to ‘go camping’. Going camping implies a holiday, to ‘go away’ somewhere, or use a campsite. 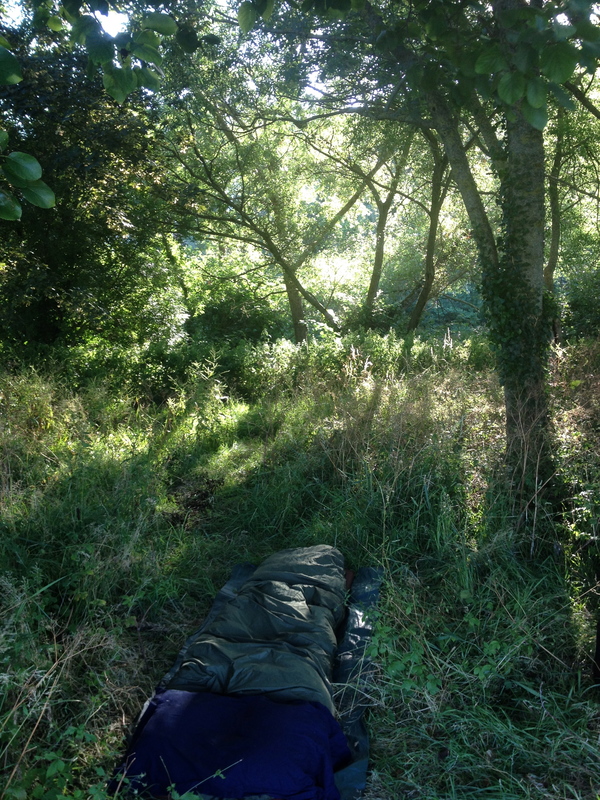 The aim is to cultivate a habit of sleeping outside, therefore getting some time in nature as part of every day life – something I’ve missed since moving out of my yurt last year. Ideally I could do this any night I felt like, at a moment’s notice, provided there was some grass nearby. This is a big part of my desire to feel free in the world. I was a little nervous pitching a tent under some trees by the light of the full moon, but by the time I lay down in bed looking up at the stars and listening to the conversations of wildlife, I felt totally safe. It felt strange to be in a tent, so I left the door unzipped so that I could see the sky, and fell asleep. At this point, you may think I’m a little crazy. 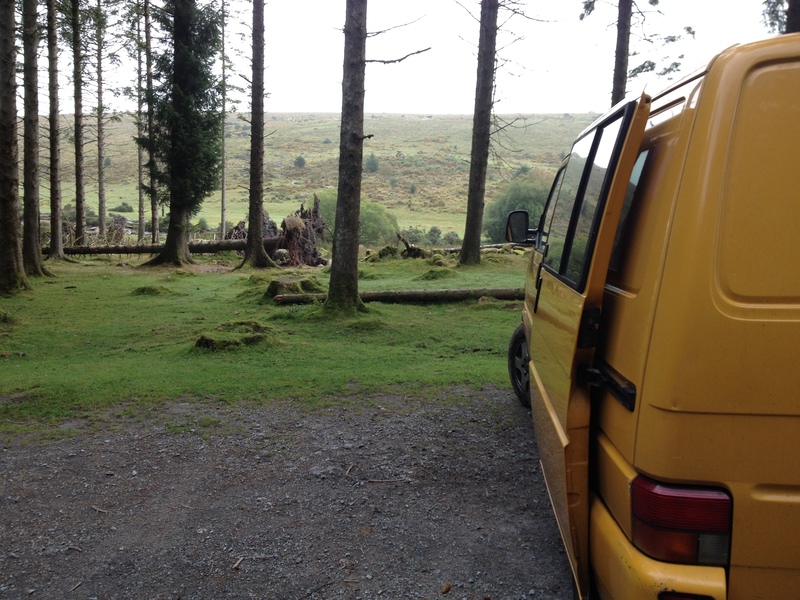 I lived in a house, then a yurt and now a van, and now I want to sleep in a field? As one college friend said ‘surely being in a house is always better? What’s the point of all this?’ And surely it doesn’t seem safe to pitch up anywhere in the dark, totally exposed and vulnerable? Isn’t it dangerous? Lately I have been missing my yurt. Many aspects of it were hard going – getting out of a damp bed to get dressed for work when it was freezing point indoors, constantly chopping wood, having no electricity and trying to hold down a normal job without anyone finding out that I lived this way. But something about it was compelling and priceless. I felt a constant underlying joy that simply came from living and sleeping so close to the earth. When I first moved out and sold my yurt, I missed it every night. I felt lonely, as if having lost an irreplaceable friend. Now I realise that feeling never actually went away, I’ve just got used to it. It’s not my yurt I miss of course, it’s the planet. Encased in 4 walls and unable to hear the elements is strange to me now. Sleeping in my van is better than indoors yes, but still rather too solid and out of contact with the ground. And yet it’s also good to have time in a house, which is more comfortable and usually a better night’s sleep. But hey, I stopped living in a yurt for some very important reasons; so I can travel, and so I can have nights in when the weather is bad. In theory, it should give me much more freedom to live as I do now, between van, housesits and friends houses. Why shouldn’t I camp out when the weather is fine? However, at the moment it’s not really working. I think that to sleep outside, one basically has to do it all year around. When I lived in a yurt my body had got used to the temperature changing with the seasons. I knew exactly how many blankets I’d need on any given night. Now, I’m used to indoor luxuries, even last night I didn’t sleep so well, even though I enjoyed waking up to ducks quacking. 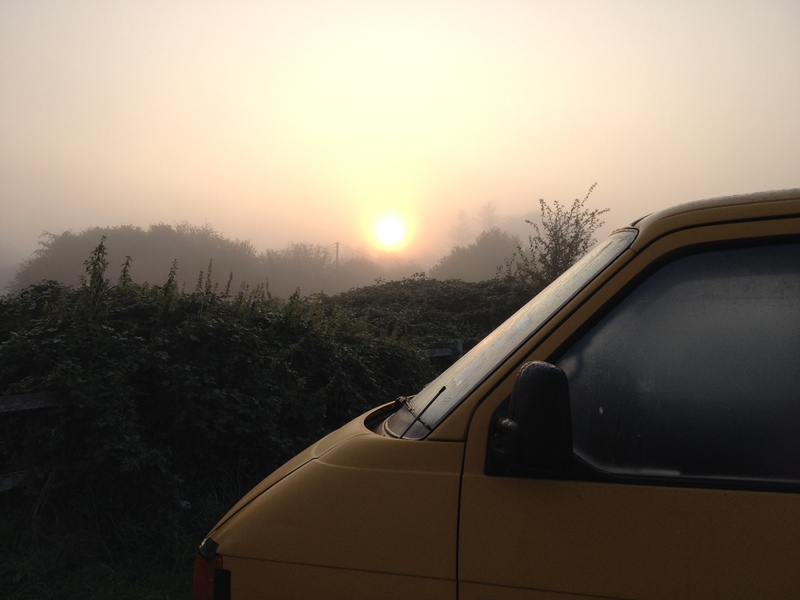 The sunrise over the van as I returned to it in the morning. – Earn so much money that I can go on holiday and book into hotels at the drop of a hat. – Live in a van which I can drive anywhere, provided I have the money for fuel. – Go anywhere van free, cycling, public transport, hitchhiking, Couch-surfing and / or sleeping outside. Ideally, wouldn’t it be amazing to have all 3? But imagine the spontaneity I could enjoy if I could sleep comfortably outside. 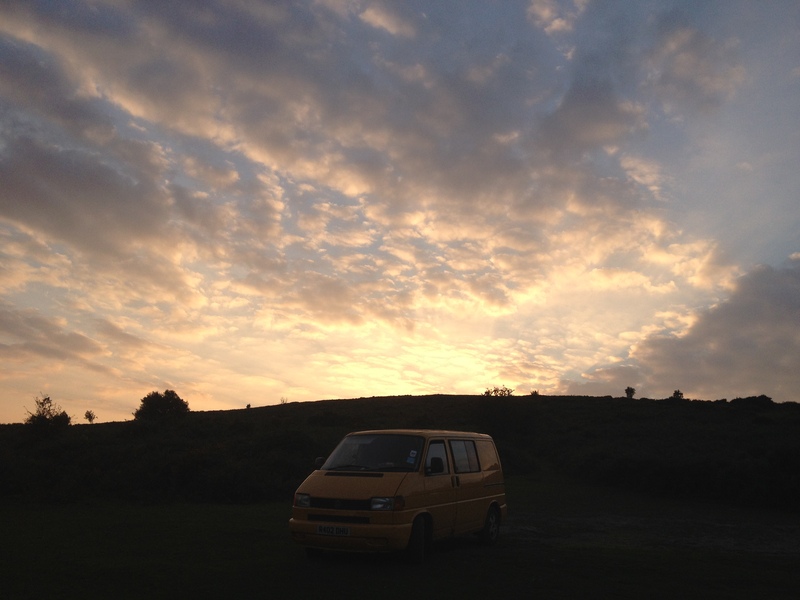 It would give me the freedom to go anywhere, with or without my van, without having to plan. I could cycle to the beach for the evening, watch the sunset and sleep there, instead of cycling back to the Vansion. Or I could drive to the beach, but sleep on it too, instead of sleeping in the van on the road further from the sea. It isn’t all that dangerous really, although there is a risk of course. People used to worry about my sleeping in a van, but in 10 years of owning vehicles I’ve never had one broken into, whether I’ve been inside it or not, so the risks are low. Sleeping outside in a field or forrest, if some harm came to me no-one would know or be there to help. But the chances of such a thing happening are far less than the likelihood of being mugged walking through a city. My previous attempts at sleeping outside without a tent. In this department, Richard The Piano Tuner is a good act to follow. 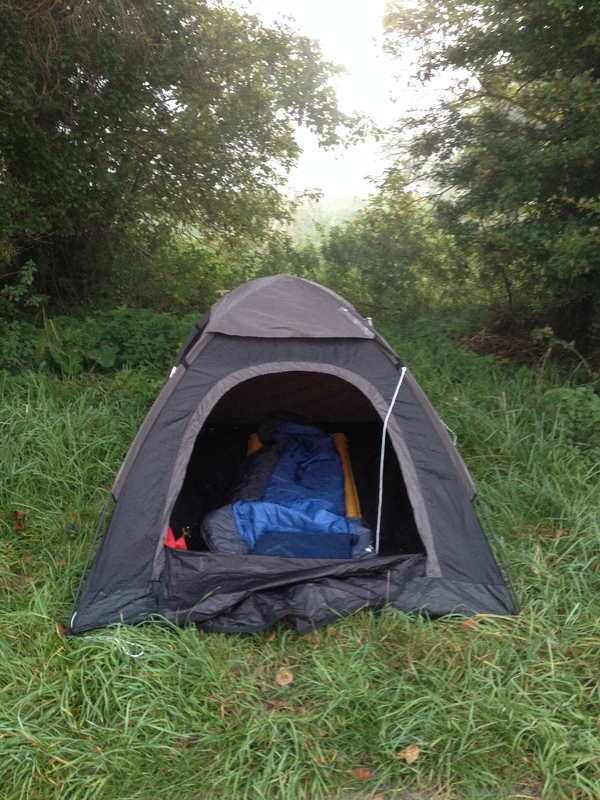 He learned to sleep rough in a bivi-bag all year round in both cities and countryside. Aiming to always feel comfortable outside Richard says ‘A good sleeping bag is worth a whole year’s rent if you sleep in it every night’. He may well have done all the testing to find the right sleeping kit so that I don’t have to. However the right kit for me may well be different to his. My current kit is still wrong and my body is out of practice. 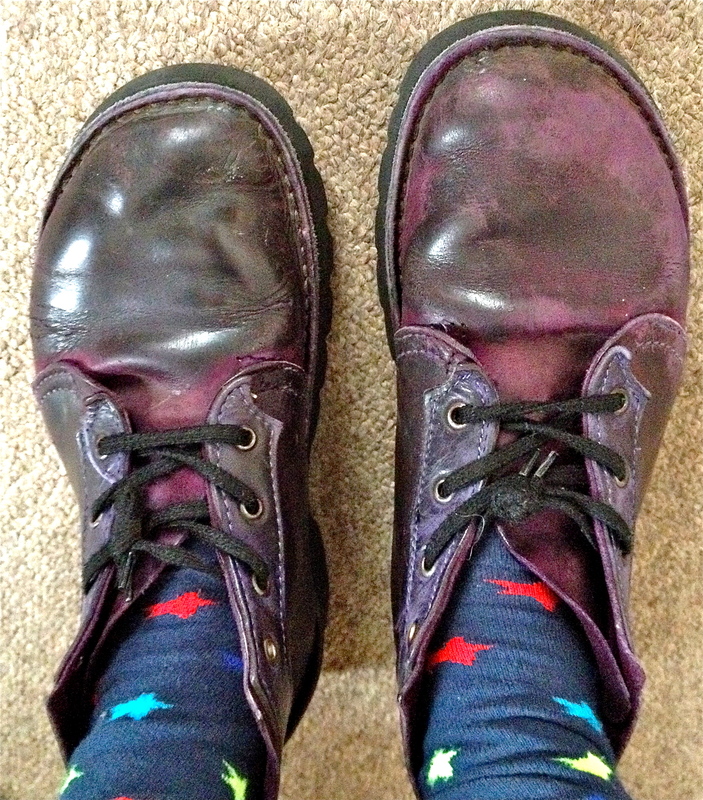 More experimentation needs doing… Watch this space! – A 2-3season sleeping bag. – A bivi bag (not a ‘sleeping bag cover’ but the bigger sort that you can fit your sleeping mat and bag in too). Am I a minimalist and could you be one too? Increasingly people are giving up high powered jobs and mortgages in favour of a “richer” lifestyle, by living with no more than they need. Well, I do gravitate towards simplicity, but I never had that high-powered lifestyle to give up. So am I a minimalist? And further more, could you have more spare cash if you were more minimalistic? Let’s look at my minimalist symptoms and how they’ve made me “richer”. Symptom1: Obsessing about having less stuff and avoiding disposables. It means I have more living space in the van, and spend less time fixing, replacing, buying and throwing away. See some useless tat in a shop? DON’T BUY IT! Symptom 2: Using the same things all the time (wearing the same clothes, using the same bag etc). You know how your oldest prized possessions really feel like yours because you’ve made so many memories in the time you’ve owned them? Your first Teddy for example? Symptom 4: Not being a mindless consumer: It turns out that I’ve instinctively taken some of the steps that minimalists deliberately take to break their relationship with consumerism. One challenge is to give up buying things (besides consumables) for a year. Joshua Fields Milburn (of theminimalists.com) writes that after a few months, it stopped feeling essential to continue with the experiment because it had already permanently changed him into someone who didn’t make unnecessary purchases. In other words, he’d broken the habit. It seems obvious now that I inadvertently went through this same process this summer when I challenged myself to let my money run out completely and then work my way up from £0. During both the descent and ascent, money became a more precious commodity. I avoided buying at all costs. First I’d spend up to a month doing without a particular “thing”, to decide if it was a “want” or a “need”. During that time one of 5 outcomes would take place. I really would buy one! Soon I’d even begun refusing free stuff unless I genuinely needed it, knowing it get in my way otherwise. After a few months of behaving like this, I rarely even want to buy anything anymore. Before The £0 Challenge, I honestly didn’t think I made unnecessary purchases. But now it’s clear that wasn’t true, because now I buy less and as a result, throw away less. Paul McKenna writes in his self-help book “I Can Make You Rich” that every person who follow’s its processes will have more useable cash. How can he guarantee something like that? Well, because the book includes methods or giving up unnecessary spending. In other words, his book’s claims work because everyone in the west buys stuff they don’t need (unless they’ve deliberately deprogrammed themselves to combat the advertising they’ve ingested all their lives). So what’s the conclusion? At first, I thought “No, I own too much stuff to be a minimalist”. But minimalism is only about getting rid of as much stuff as frees you to have great life experiences. It’s not about deprivation. For that reason, I’d encourage everyone give it a go – after all, it’s not such a big deal giving up the stuff you don’t need, right? Why not give up buying stuff for a month and see how it changes you? I like simplicity and don’t like waste (of time, energy, money, or stuff). All the steps I’ve taken to simplify my life have been great, even though I never led a complicated life in the first place. My experience is that of course lack is a problem, but excess also a problem, more so than you’d expect. But living with less isn’t about what you have; it’s about what you don’t have. Minimalists often publish lists titled “The 100 things I own”, but a lists titled “100 Things I Don’t Own Anymore”, including how they learned to live happily without it would be much more interesting and helpful. Maybe I should write one?